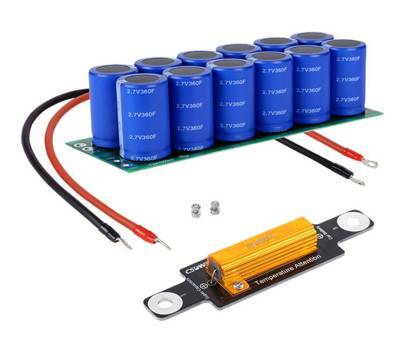 A supercapacitor is a specialized form of the capacitor with an exceedingly high level of capacitance. They are electrochemical capacitors that have an unusually high energy density when compared to common capacitors, typically several orders of magnitude greater than a high-capacity electrolytic capacitor. Their storage capacity is incredible, currently up to 650 Farads. Modules allow even greater storage and higher voltage ratings. The technology behind supercapacitors is different to that of an ordinary capacitor. It has to adopt a different approach to enable the ultra-high values of capacitance to be attained. There are several types of supercap or ultracapacitor technology that can be used but the most widely adopted is known as the double-layer capacitor, DLC. This form of the technology is carbon-based and it has an organic electrolyte that is easy to manufacture. Like traditional capacitors, supercapacitors have two metal plates. These plates are coated with activated carbon which is a sponge-like porous material. These plates are immersed in an electrolyte which contains positive and negative ions. One carbon-coated plate, or electrode, is positive, and the other is negative. During charging, ions from the electrolyte accumulate on the surface of each carbon-coated plate. Electrical double-layer capacitor: An EDLC stores energy in the double-layer at the electrode/electrolyte interface. In this type of capacitor, the electrode material used for the construction of the cell for the former is mainly carbon material. For both types of capacitor, the electrolytes can be either aqueous or non-aqueous depending on the mode of construction of capacitor cell. It is for this reason for supercapacitors and double layer capacitors may be marketed separately using different names. 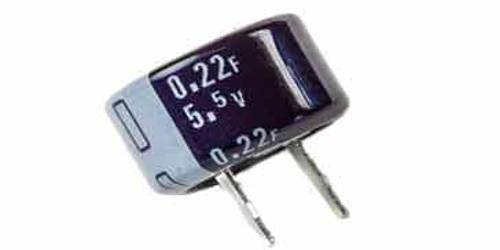 Often the double layer capacitors do not have quite as high a capacitance level.